Best-selling author, scientist, and atheist Richard Dawkins puts his assertions to the test when he debates his Oxford University colleague John Lennox, who is both a scientist and a Christian theologian. Remaining true to their goal of engaging secular culture on critical issues in a thoughtful, respectful manner, Fixed Point Foundation sponsored a debate on what is arguably the most critical question of our time: the existence of God. The debate featured Professor Richard Dawkins - voted by Europe's Prospect magazine as one of the world's most important intellectuals, and regarded by many as the spokesman for the "New Atheism" - and Dr John Lennox, a popular Christian apologist and scientist, who travels widely speaking on the interface between science and religion. Like Dawkins, he has dedicated his career to science, but he has arrived at very different conclusions. Lennox possesses doctorates from Oxford, Cambridge, and the University of Wales. 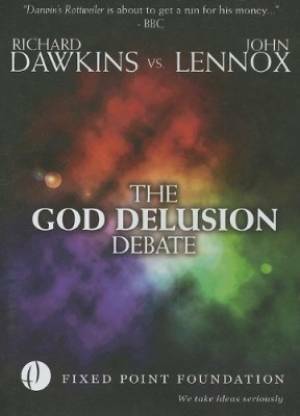 The debate centres on Dawkins' views as expressed in his best-seller, The God Delusion and their validity over and against the Christian faith. The God Delusion Debate by Richard Dawkins ; John Lennox was published by Authentic Media in October 2008 and is our 54093rd best seller. The ISBN for The God Delusion Debate is 837101440462. Be the first to review The God Delusion Debate! Got a question? No problem! Just click here to ask us about The God Delusion Debate.